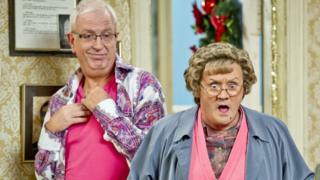 Rory Cowan, who plays Mrs Brown's hairdresser son Rory in hit sitcom Mrs Brown's Boys, has left the programme. Cowan said he had been "unhappy", and left his co-stars after a Mrs Brown show at London's O2 Arena on Sunday. He has worked with the comedy's creator Brendan O'Carroll for 26 years. "I hadn't been happy working for the Mrs Brown's Boys company for the last 18 months to two years," he said. "I feel that 26 years is enough so I decided it was time to go." Cowan told O'Carroll last month that he wanted to quit, but was persuaded to stay for the latest part of the Mrs Brown tour. "I told Brendan on 16 June about my decision to leave," Cowan told the Irish Daily Mail. "That's when I handed in my notice. "I was supposed to leave at the end of that week, but Brendan said that would be impossible and asked if I'd stay on until the end of the London O2 gigs. So I agreed to that." He said there was "no bad blood" between the pair. "I'm not going into details about why I was unhappy. I did the final show, packed my stuff into a small Waitrose plastic bag and just left the venue." In a statement, O'Carroll described Cowan as "a legend". "To all of us it feels like Ronaldo leaving Manchester United," he said. "But Ronaldo went on to amazing success which I know Rory will too. "I can't even quantify the contribution Rory has made to our success and the well-being of me and my family, not just on screen or stage but way before that as a friend and a driving force in getting us here." Cowan started off as O'Carroll's publicist - a job he took after being made redundant as a marketing manager for EMI Records. He only became part of the Mrs Brown's Boys cast when an actor dropped out during a tour and O'Carroll couldn't find anyone else who could learn the lines in time. The success of the stage show led to the BBC TV series, which began in 2011.